Cover art copyright 2000 by Thomas M. Sipos. Cover art by Stuart Smith of Graviton Creations. Manhattan Sharks is a satire of corporate culture, job-hunting, and America's obsession with status and career success. It's the 1980s -- the rise of the yuppie. A world of ex-hippie success gurus and millionaire cookie barons. Marxist revolutionaries and Ayn Rand cultists. Nightmarish job interviews and hellish subway rides. And at the corporate bottom -- the nameless and the faceless. Petty coworkers and cheap office parties. Secretaries and clerks and office drones leading lives of quiet desperation in a little gray cubicle in yuppie hell. In the tradition of Bonfire of the Vanities, Dilbert, Clockwatchers, The Office, and Up in the Air. One of the great failings of contemporary conservatives is their inability to deal with the dangerously narcotic effects of wealth and privilege. [Sipos] not only addresses this failure, but does so with a brilliantly twisted sense of humor. Manhattan Sharks is the most hilarious American novel I've read this year. I can say this in all honesty: If you have ever suffered through the topsy-turvy world of job interviews, if you have ever found yourself trapped in the cloistered cubicles of America's bureaucratic businesses, and if you lived through the 1980s (and can remember them), then you must read this book. Stocked with colorful characters, using absurd situations, and employing a well-choreographed plot, Manhattan Sharks is an entertaining and insightful parody of modern American mores. What will life be like after graduation? How will you prepare for the big job interview? What is the difference between a charcoal gray suit and a gunmetal gray suit, and why does it matter? Manhattan Sharks answers these questions and more in a satirical look at careers and daily life in 1983 in New York City. It is hard to summarize the plot, since there does not appear to be one upon cursory examination. Dig deeper, however, and it is not just a story of job hunting and corporate ladder climbing. It is a story of friendship, romance, and the search for the perfect résumé. Sipos tells the story in vignettes, and it is sometimes hard to follow where he leads. Nevertheless, the reader quickly adjusts to the somewhat choppy narrative style and becomes engrossed in the stories. The characters are somewhat tough to like, but they are always realistic and believable. Funny and entertaining. A satire of corporate life and personal greed in 1980s New York City, specifically during the sweltering summer of 1983. It is an amusing work with clever period details and phrasing. The villain is a former hippie who has turned into a consumerist yuppie but still holds all the appropriate "progressive" opinions on topics such as gun control. The observation that most yuppies were fiscally conservative but socially liberal is still not exactly commonplace today, and Sipos's book brings this point home forcefully. Many liberals have latterly envisioned the 1980s in the United States as a uniformly archconservative Decade of Greed, but Sipos adeptly implicates them in the mess by repeatedly rejecting conventional ideas of class and politics. 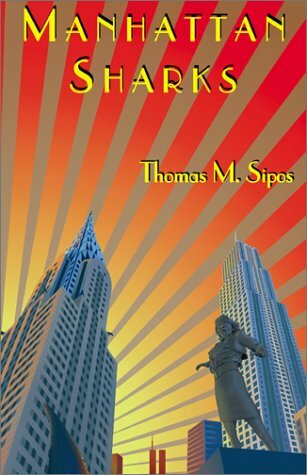 At times humorous, at other times satirically somber, Manhattan Sharks follows the quotidian trials of Henry Willoughby, a recent college graduate thrust uncertainly into the early 1980's New York City labor market. Henry's plight is contrasted with several other characters directly or indirectly connected to his low-level job as a TV ratings analyst in Manhattan, a place repeatedly characterized in the book as shark-infested. With one exception, however, none of the novel's characters is a "shark" at all. Like Chuang Tse's butterfly that may be dreaming he is a man, most of the characters in Henry Willoughby's world are guppies dreaming they are apex predators, or harboring dreams of becoming one. The sea in which these schoolfish swim is actually an ocean of upward mobility, a social eco-system into which they are the first generation born. This was a new economy, in no small part the product of Reagan administration policy initiatives and efficiency gains in industry that created excess wealth. It is also an environment these children of relative privilege only think they understand, one whose rules have been inchoately learned by them through the filter of institutions hostile to the values and attitudes needed to navigate these uncharted waters. The combination of wide-eyed idealism and abstract, impractical education found in Sipos' characters results in a comical mix of self-pity, apathy, neuroses and delusion. What almost all these characters have in common is that each of them fails to realize what they lack and, even more tragically, what they want. Their goals have been defined by others, as have their self-images. Well-written, fast-paced, and unapologetically caustic in its humor.